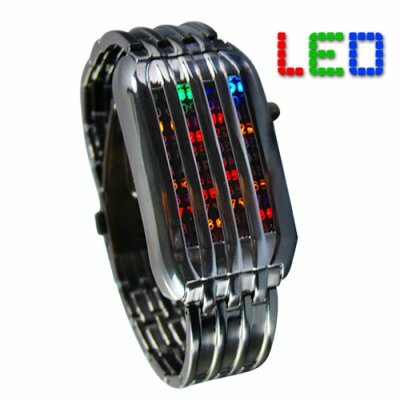 Successfully Added The Cylon - Japanese Style Multicolor LED Watch to your Shopping Cart. Introducing The Cylon, a red, yellow, green, and blue LED watch from the distant future which puts to form the coalescence of cool by re-establishing how temporal data (time) should be displayed. You mean this watch really tells the time? Yes. Even though The Cylon symbolizes cybernetic style and cusp design with its ricocheting red, yellow, green, and blue LEDs encased in forged steel hues (like Colonial Vipers and Cylon Raiders in a dogfight for their lives! ), this Japanese LED watch does in fact tell the time and does so really efficiently too! Tap the display button on the right side of the timepiece and watch the screen light up. There are four columns. The first two columns represent hours. The last two represent minutes. What could be easier? In fact, when you start wearing this watch you may find that you suddenly have control over other watch wearers. Something about "one watch to rule them all, one watch to find them..." Of course you needn't be a Nazgul or a Cybernetic Lifeform Node to wear this watch. In reality, this watch is perfect for Mandalorian warriors, science fiction film directors, Mount Everest climbers, Sherpa guides, stand up comedians, Traceurs or Traceuses, or anybody who is a somebody. Just google "Japanese LED Watch" to see how much these timepieces sell for online. Notice how they normally retail for close to 10x the price we're selling them for. Even if you don't intend on buying one for yourself, stock your online store with these headturning watches to lock in some amazing profits! Brought to you by the leader in direct from China wholesale electronics - Chinavasion. This Japanese LED watch uses two CR2032 watch batteries. Other names this type of battery goes by are button cell, silver button cell, or coin cell batteries. Why is this watch called The Cylon? You mentioned that this watch is perfect for your average science fiction film director, Mount Everest climber, Sherpa guide, stand up comedian, Traceur or Traceuse. What if I don't belong to one of these groups? This watch is also perfect for forex traders, comic book artists, minimal techno DJ's, Youtube directors, Gameboy Color owners, Mario Kart double dashers, and anyone who still listens to music on cassette tapes. I've noticed that depending on the photo, the watch looks different. Also you've listed the bracelet color as "Camouflage Onyx Steel". Steel is silver. Onyx is black. Seriously, what color is this watch? That's a good question. Depending on the ambient light conditions, this watch sometimes looks gun-metal silver. At other times it looks light silver. Other times it looks almost black or deep Onyx. The reason for The Cylon's elusive countenance is its scratch-resistant electroplated finish. This has resulted in a refractive process which breaks the light which lands on the watch into its component colors and reflects into your eye at different wavelengths. That's why it's so hard to describe the color of this watch. got my orders from chinavasion in a week...thanks..
on 2010-04-27 18:59:24 Hallo from Greece!Amazing Futuristic Design! Amazing watch!My best from this collection!This watch is from Future!Star Trek! !It cames at my place..in about 12 Days!Give us more designs to Buy from you Chinavasion!Thanks for this amazing futuristic watch!Respect from Greece! on 2010-01-04 16:44:16 A Very Corlorful Watch!!!!!! Hello Chinavasion, First and foremost I love the products that you have, your service is excellent and getting the product processed and shipped out to you is great. Keep up the good work!!!! This watch is very impressive and colorful, it's easy to read even in the sunlight. A lot of people seen this watch and loved it. The only flaw is , the band needs more linkeage because everybodys wrist is different. With that in mind, more watches could be sold. Bring on more new watches!!!! Ok, I ordered this for my brother for xmas and it arrived in the US in 3 days. Woooow. This is the fastest shipping ever. I mean i have ordered things from China vasion before and i usually get them around 10 days, but this one is a record best so far. Thank you guys for your business. Great Job. Order arrived in just 3 days with DHL .. Watch was impressing me as well as anyone ells who saw it .. really like it's technology & how stylish it is. Was packed well and came in small metal box ready for a gift & it was working out of the box.